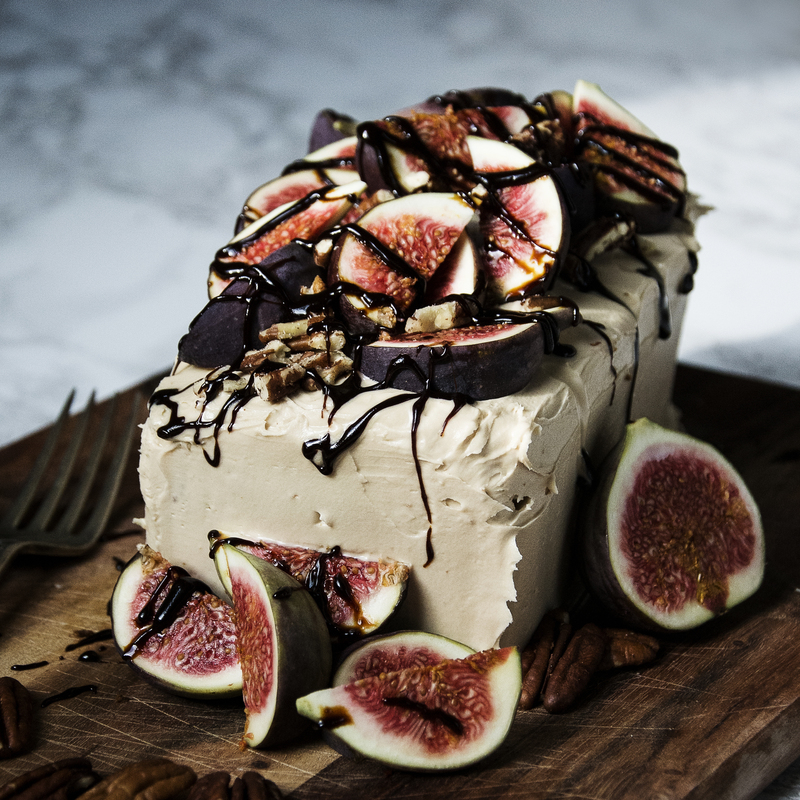 Caramel and pecan cake with cream cheese frosting topped with fresh figs, pecans and a sweet balsamic glaze. I love figs, and you wouldn’t believe my excitement when I popped into the supermarket and saw that figs are back in the shops. 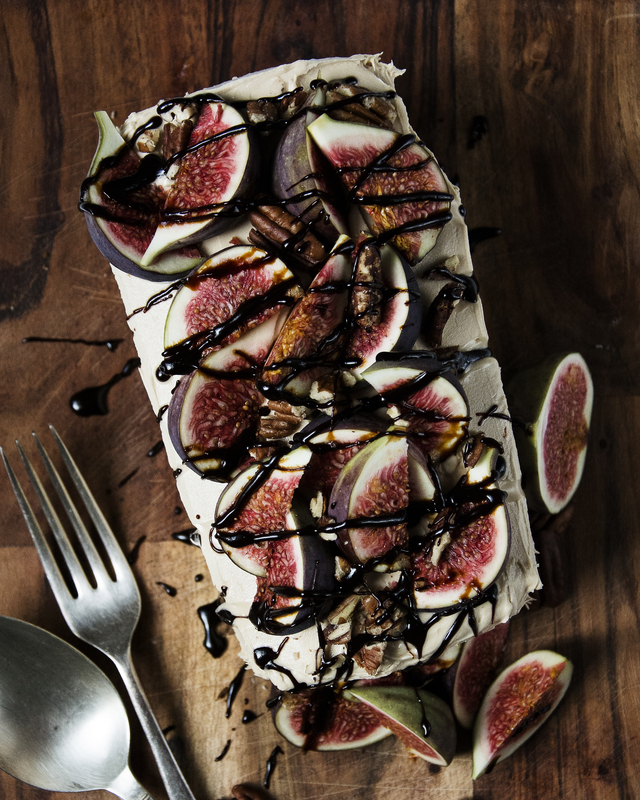 This cake is beautifully sophisticated, not too sweet and topped with beautiful fresh ripe figs and a tart yet sweet balsamic glaze that is a really interesting combination. Pre-heat oven to 180°C. Line an 8″ loaf pan and spray with non stick cooking spray. In a bowl cream together the sugar, butter and vanilla until pale and creamy. Beat in the eggs one at a time, beating well in between to fully combine. Sieve the flour into the mixture, adding the salt and baking powder and fold the mixture to combine. Add the milk, and beat, either with a wooden spoon or an electric whisk until everything is combined. Bake for 45min or until a skewer comes out of the cake clean with inserted into the middle. Add the cream cheese, it HAS to be full fat. Beat in the cream cheese with a wooden spoon. When the cake has fully cooled, slice in horizontally into three long slices. Add an even layer on the frosting to the bottom and middle sections before re-assembling the cake. Spread the icing in an even layer over the entire cake. If the cake is a little crumbly, add a thin crumb coat of icing first and put into the fridge until cold. You can then spread the remainder on the icing over the crumb coat. To make the balsamic glaze, place all ingredients into a pan over a high heat, bring to the boil then turn the heat down to medium and simmer for 15min or until the vinegar has taken on a thick, syrupy consistency. Leave to cool for 10 minutes while you decorate the cake. 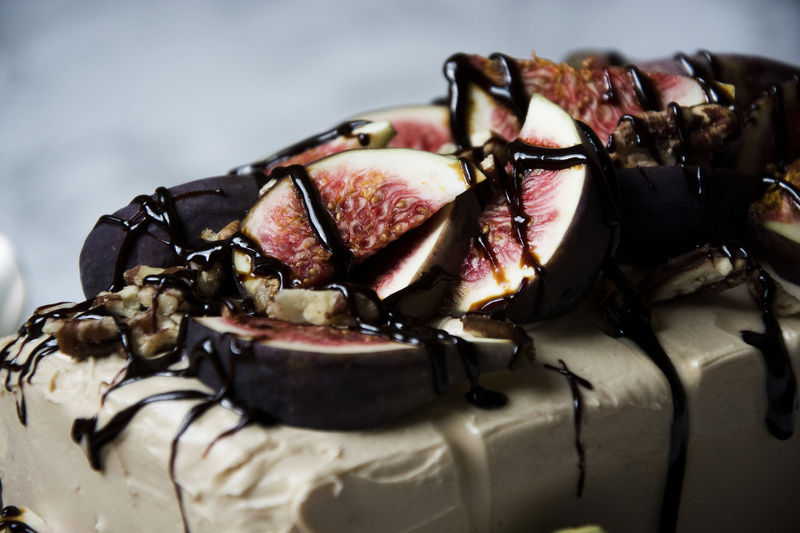 Cut the figs into 8 and play them across the top of the cake. Lightly crush the pecans by placing them into a zip lock bag and hitting with a rolling pan. So there you have it. A sophisticated cake for all occasions! If you give it a go let me know how it goes by tagging @whatseatingmanchester in your social media post!